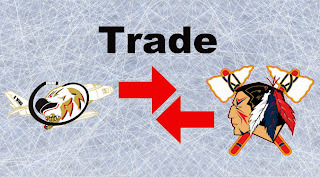 On Thursday Johnstown made a trade with the Trenton Golden Hawks to bring Forest Donovan to Johnstown. In the deal, Johnstown did not lose anyone from their current roster. Donovan is no stranger to the Tomahawks as he was drafted by Johnstown in the 2013 NAHL draft. He also successfully made it to Johnstown's main camp and was listed to go into training camp with the team before he took his game to Canada. At the beginning of the 2013-2014 hockey season, Donovan skated with the Carleton Place Canadians of the CCHL. He appeared in 14 games, scoring five goals, one assist, good for seven points, and had six penalty minutes. With the Trenton Golden Hawks of the OJHL, he appeared in 7 games, scoring two goals. During this past summer, Donovan was selected in the 6th round, #131 overall, by the Johnstown Tomahawks in the NAHL draft, having come out of the MWEHL playing the past two seasons with Belle Tire U18 team. In 80 career games with Belle Tire, Donovan scored 14 goals, 34 assists, good for 48 points, and had 18 penalty minutes. Forest Donovan is a 1994 birth year player, standing at 5'11, 185 pounds, and is from San Diego, Ca. Other players drafted by the Tomahawks this past season with ties to the roster are, goaltender Brett Young, defensemen, Tristan Ramage, and Brady Bender. Donovan traveled to Johnstown last night and is expected to be in the lineup this weekend vs. the Wenatchee Wild. Donovan plays a physical game, has good size, and has a way of finding the net. He should fit right in with the guys and help the team battle to extend Johnstown's current winning streak.